Bedford Town were edged out 2-1 by AFC Rushden & Diamonds despite putting in a spirited display at The Eyrie on a blustery Boxing Day afternoon. Bedford took the lead in the 18th minute when debutant striker Afolobi Obefemi slotted home after strike partner Sergine Mor Diop had seen an initial shot blocked. Aside from a Tom Lorraine half-volley which cleared the crossbar, both sides struggled to create any meaningful chances in a half dominated by midfield skirmishes. However, the away side returned for the second half with renewed vigour and found an equaliser within four minutes of the restart. 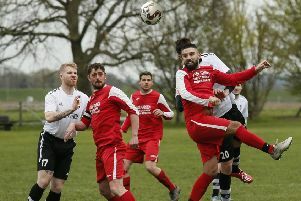 Shawn Richards fired in a free-kick from the left side, which was initially flicked on by a Bedford player and then hit another home man on its way into the back of the net. Rushden were playing with a higher tempo and urgency, and it bore its results further when they scored the winning goal in the 66th minute. Richards again was the provider as he latched onto a loose ball in the Bedford box, clipped a ball to the far post and found Tommy Berwick to fire in a half-volley leaving the goalkeeper no chance. Diamonds had to withstand a late spell of pressure from the Eagles, as Obefemi first blazed over while under strong pressure from Ollie Wilkinson, and then saw an effort well blocked behind by Finlay after he had been released in behind the visitors’ defence. A late corner, deep into stoppage time, then somehow ended up going over the bar despite it being a free header from close in, but Rushden managed to hold on for the three points.